You don't have to wait for Halloween to make a pumpkin cake for dogs. 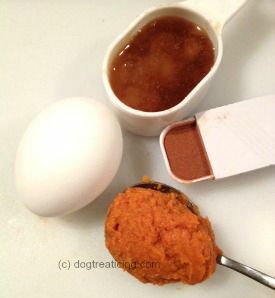 Pumpkin is a healthy dog treat ingredient. It contains alpha-carotene which is eventually converted to Vitamin A, essential for healthy vision and a productive immune system. Alpha-carotene promotes good skin health too. 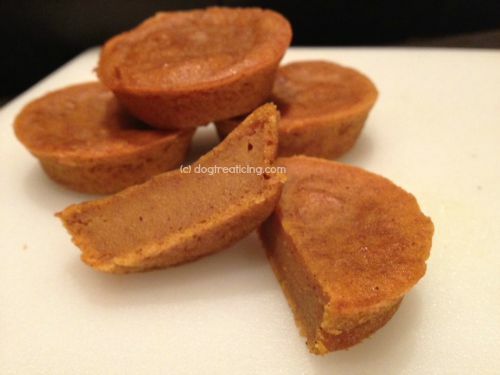 Fresh or canned pumpkin is the featured ingredient in this dog cake recipe. Make sure you do not use the pumpkin pie filling because that contains a large amount of sugar. 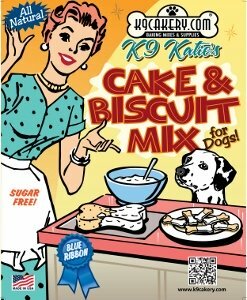 This dog cake recipe lends itself very well to a batch of dog cupcakes. The cakes will look like pumpkin muffins and will taste like pumpkin muffins. Cinnamon and honey will complete the recipe. You will be using all natural, human grade ingredients, and trust us, it will be hard not to taste these yourself. Since the ingredients are all human grade and the recipe has been adjusted to be palatable to humans as well, make a cup of coffee and enjoy one with your dog. Mix the cake mix, egg, pumpkin, cinnamon, honey water and oil together in a large mixing bowl. Stir by hand until well-mixed. Pour the mix into greased mini cupcake tins filling each approximately 2/3 full. Bake 28-30 minutes or until a toothpick inserted into the enter comes out clean. For your dog's pleasure: Spread Fido's Frosting dog treat icing on top when cool. Prepare according to directions on the package. 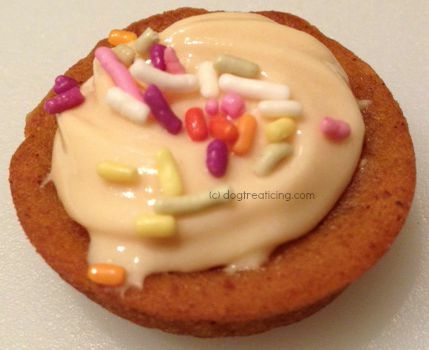 Decorate with all natural sprinkles (contain no sugar). Let the frosting dry completely. It will dry hard and will not need to be refrigerated. Add the pumpkin and cinnamon and mix together. 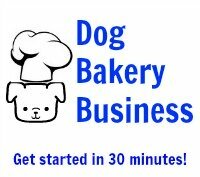 Click here for more easy dog cake recipes.